Deputy President (DP) William Ruto on Sunday gave the hunger and starvation in the northern Kenya a wide berth instead focusing on his rival Raila Odinga. Mr Ruto urged the Orange Democratic Movement leader to first fix the issues in his party before lecturing the government on good governance, especially on the fight against corruption. The DP's comments come as the friction between the politicians escalated amid heightened calls for suspects linked to mega corruption in the public sector to be charged. 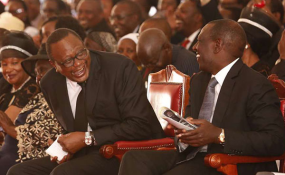 While in the company of eight MPs at a fundraiser at the PCEA church in Mwiki, Nairobi, Mr Ruto said those soiling his name over corruption scandals were doing it to scuttle his bid to succeed his boss, President Uhuru Kenyatta, in 2022. Mr Ruto, without mincing his words, castigated Mr Odinga for the umpteenth time saying the opposition chief came to wreck the Jubilee Party in the pretext of enhancing peace courtesy of the handshake. "Ule mtu wa upinzani anajaribu kutufundisha jinsi ya kuendesha serikali na vita dhidi ya ufisadi ilhali upinzani umesambaratika. He should fix the opposition first before he comes to lecture us," a seemingly agitated Ruto said. Interestingly, despite the biting hunger in about 13 counties, the DP did not give an update on what the government has done so far to ameliorate the situation. In his usual style, Mr Ruto did not shy away from saying how the government will convert the dilapidated Kasarani-Njiru Road into a dual carriageway, in disregard of the President's directive that no new projects will be launched until the old ones have been completed. "Kitabu ya Mathayo inatuambia, jihadhari na nabii wa uongo. Wanakuja kama kondoo kumbe ndani yao ni mbwa mwitu," he said in reference to Mr Odinga's support to the President in the graft war. "They should not cheat us because we know them," he said and swore not to allow "outsiders to engineer" the problems in the Jubilee and by extension jeopardise the chances of succeeding the President. "I am saying this as the Deputy President of the republic of Kenya and the deputy party leader of Jubilee, we will not allow them to bring chaos in Jubilee. We will not accept. They should also know that we are well prepared." Those who accompanied the DP included: Kiambu Governor Ferdinand Waititu and MPs Kimani Ichung'wah (Kikuyu), ODM rebel Aisha Jumwa (Malindi), John Kiarie (Dagoretti South), Patrick Wainaina (Thika Town), Benjamin Gathiru (Embakasi Central), Charles Njagua (Starehe), Kimani Ngunjiri (Bahati) and Jeremiah Kioni (Ndaragua). In an apparent case of a script well-rehearsed, speaker after speaker including the MPs reminded the President that he must respect the pledge he made to Kenyans ahead of the August 2017 General Election. They said that the President's rallying call to Kenyans that they give him 10 years and his deputy 10 years after his term ends in 2022, should not be wished away. Mr Waititu rallied his Mt Kenya backyard to support Mr Ruto, saying were it not for the DP, Mr Kenyatta would never have made it to the presidency. "The 10-year agreement must be followed. We do not want to be called conmen," Mr Waititu said. "The only handshake that we know of is that of 2013 when the President and his deputy embraced each other at Jevanjee Gardens. The other one is not genuine," Mr Ngunjiri said in reference to President Kenyatta's embrace of Mr Odinga on March 9, 2018 at the stairs of his Harambee House office.